I have been asked many many a time for advice, help, support, when it comes to fitness and health. It’s what I do, what I love, and I thrive on helping others succeed with their fitness and health goals. One thing that always makes or a breaks someone’s success is their commitment. See there really cannot be any excuses before or during your journey to a healthier person. 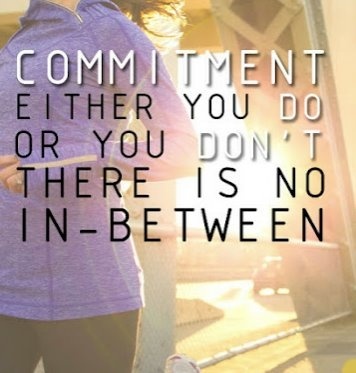 You either commit or you don’t. There is no in between. This can be applied to all facets of life whether it be business, family, religion, etc…You choose or you choose not to. If you have excuses or if you think you will fail than you have already chosen not to and you never give yourself that chance to break the cycle and succeed. So choose to commit to whatever it is that is put in front of you; if it is something you really want. Take it one day at a time and remember every little accomplishment leads to success.